The Ridge Loop is put together by making use of the Reservoir #1, Ridge, Hay Press and Turkey Flats trails. 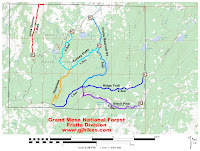 All of these trails are located south of Glade Park in the Fruita Division of the Grand Mesa National Forest. 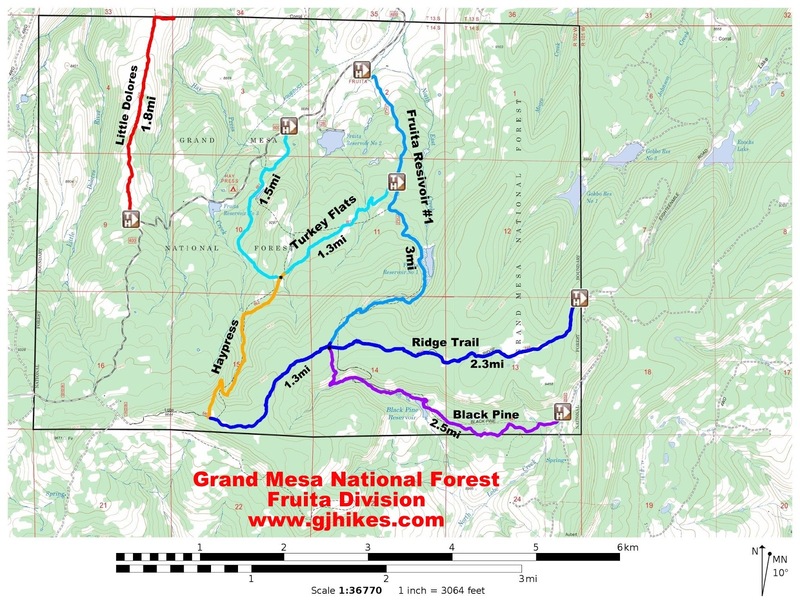 The Fruita Division of the Grand Mesa National Forest is about 27 miles due west of the main reservation on top of the Grand Mesa. One of the purposes of national forests is not only to preserve the trees but to manage and protect the water supplies. For the sole purpose of protecting the Town of Fruita's water supply the Fruita Division was added to the Grand Mesa National Forest reservation in 1906 by President Theodore Roosevelt. Access to the trailhead can be made with a 2-wheel drive vehicle on dry roads by turning south at the Glade Park Store on 16 1/2 Road. The pavement ends after 2.6 miles and you pass the Mud Springs Campground at 6.4 miles. Take the right fork at 7.6 miles and continue on 16 1/2 Road. Stop at the turnoff to Fruita Reservoir #1 after about 9.5 miles and park at the Fruita Picnic Area. Forest Road 400.2C which leads from 16 1/2 Road to Fruita Reservoir #1 is closed between December 1 and May 30 of every year. The road is supposed to be closed at all times to cars and trucks but that doesn't seem to be something that is enforced. The road gains about 300 feet of elevation in the first mile where it passes the east trailhead for Turkey Flats. This point marks the beginning of the loop that this particular hike is going to make. Following the road for another half mile, gaining another 150 feet of elevation, brings you to the beginning of the Reservoir #1 trail. There is a vault toilet and a spigot for non potable water at the trailhead. With all the cows in the area it is a must to filter drinking water no matter how pristine it looks. The Reservoir #1 trail travels around the west side of the lake. Once it nears the south end of the lake it begins the climb up to the Ridge trail. The trail gains another almost another 400 feet of elevation over the mile and a half length of this section of the trail. Most of the climbing is fairly gentle with only a few steeper spots. A commemorative plaque on an aspen tree of a former patron and the one left behind who has adopted this section of trail in loving memory. The Reservoir #1 trail comes to an end when it meets up with the Ridge trail. This is also the junction where the Black Pine trail comes up from the south and meets with the Ridge trail. To continue with the loop we follow the Ridge trail to the right as it heads on west. The Ridge trail section of the loop lasts for just over a mile and a quarter. The trail is mostly flat through here and there is one gate to pass through. The cows have made paths along the fence line that look like good trails but the correct route is to go through the gate. The sign for the Hay Press trail comes along before reaching the official end of the Ridge trail. You might encounter ATV or dirt bike traffic while you are hiking the Ridge trail but once you turn onto the Hay Press trail it is open only to hiking, equestrian and mountain bikes. The Hay Press trail begins following the back of a narrow ridge before dropping down a switchback that carries the trail over to the opposite side of the drainage. From there the trail continues to descend at a gradual pace as it heads down to the junction with the Turkey Flats trail. Some fun loving mountain bikers have made a jump over a log that the trail makes a dog leg around. I came upon some deer that were very close to the trail as I passed by a meadowy slough. With ears like that it's no wonder that deer can normally hear you coming a mile away. The Hay Press trail meets up with the Turkey Flats trail in a clearing at about the mid point of that trail. To complete the loop we make a right turn and head back to the east toward Forest Road 400.2C. This section of the Turkey Flats trail is mostly flat except for one wash that is about 50 feet deep. The Turkey Flats trail is very pleasant and picturesque. The Turkey Flats trail comes out on Forest Road 400.2C where the loop began. As you can see from the vehicles parked here the sign at the bottom of the hill about no vehicles doesn't have much impact. If they really want to keep vehicles off the road maybe they need to come up with something different. The picnic sites look pleasant enough if you are ever just looking for a place to take your family. There is a nearby stream to play in and a restroom. Most mountain bikers would probably do this loop by beginning at the Turkey Flats trailhead on 16 1/2 Road. If you continue past the picnic area for about another half mile you will be there. While the Ridge Loop isn't an official name for any trail it seems appropriate enough to describe this combo. The hike is a great route for seeing a lot of the Fruita Division of the Grand Mesa in one outing. If you would like to see it for yourself then all you have to do is 'Take a hike'.